Deaths feared in 'major catastrophe' Jump to media player The derailment and explosion of a train carrying petrochemicals through a Canadian town has been described as a "major catastrophe" by a local official. Derailed train explodes in Canada Jump to media player The centre of a small town in Quebec, Canada, has been destroyed, after a train carrying petroleum products exploded. 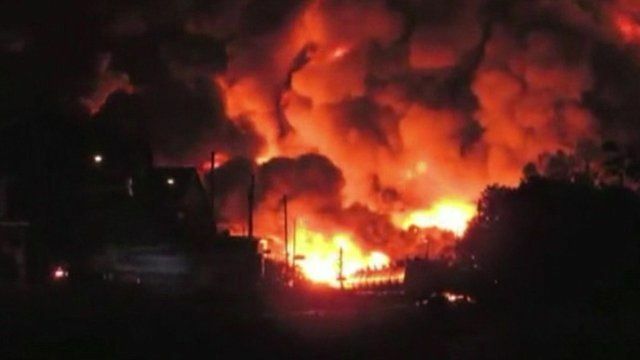 The derailment and explosion of a train carrying petrochemicals through a Canadian town has been described as a "major catastrophe" by a local official. Sgt Gregory Gomez Del Prado, of Quebec Provincial Police, said firefighters from a number of towns in the area were trying to tackle the blaze. 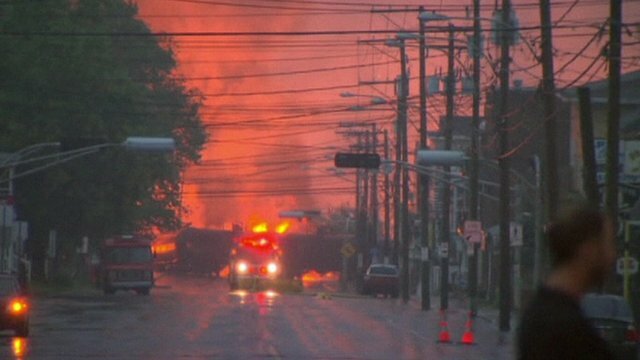 Around 1000 people have been evacuated from Lac-Megantic. Sgt Del Prado said he feared there would be fatalities.